You know, instead of pooping them. For my first gluten-free Thanksgiving I’ve been practicing on my friends and family. They appreciate it, really. ‘Cuz I’ve found some freaking delicious gluten-free sides, starters, desserts, and anything else you can think of to shove in your (gluten-free) pie hole. Honestly, they won’t even know that you painstakingly scoured the Interwebs and the cook books to convert normal recipes into ones for us freaky types. But this recipe that appeared in the New York mag’s holiday cooking with celebrity chefs issue is so crazy good — even gluten-free — that you can just make this sweet potato meringue pie with pecan crust and burn the turkey for all they’ll care. And there was only one gluten-free substitution I had to make! Luckily I’ve been practicing the graham cracker crust business with my Kinnikinnik gf graham crackers, so it was no problem. Also I sub’d vanilla for vanilla paste because what the heck is that? Vanilla paste sounds awesome, but I just couldn’t find it after a three grocery tour. (By the way, can we talk about how my Whole Foods isn’t as good as it should be?) But other than that, these are the most important things you need to make this ah-ma-zing Thanksgiving dessert. A toasted pecan, graham cracker, cinnamon, fresh ginger, brown sugar crust is da’ bomb. You guys, this crust is epic. In fact, this whole dang recipe is epic. Even though I was slaving for hours, it was incredibly satisfying to create a masterpiece like this. My husband, however, was like, “Come to bed already!” But look at phase two, which is the bourbon, sweet potato and brown sugar portion of the recipe. Then came the meringue, and it was all over. I totally licked that. You guys, this is one of the most amazing pies I’ve ever made. You should totally get your g-free graham crackers up in this and go nuts this holiday season. Here’s how! 1. Start with the crust. Preheat oven to 325 degrees. Grind pecans in food processor to coarse powder. Add the gluten-free graham cracker crumbs, and grind with nuts until powdered. Add the ginger, dark-brown sugar, salt, and cinnamon, and process to combine. Gradually pour in melted butter until evenly distributed. 2. Press crumb crust into a pie pan, shaping it evenly across the bottom of the pan and the sides. Bake the crust, flattening it with the back of a spoon every 10 minutes or so, until it is golden brown and stays firmly pressed in the pan (40 minutes to an hour). Set aside to cool. 3. Preheat oven to 350 degrees to roast the sweet potatoes. Roast about one hour, or until tender all the way through. Let cool to room temperature, then peel potatoes and puree in the food processor until smooth. 4. Reduce oven temperature to 325 degrees. 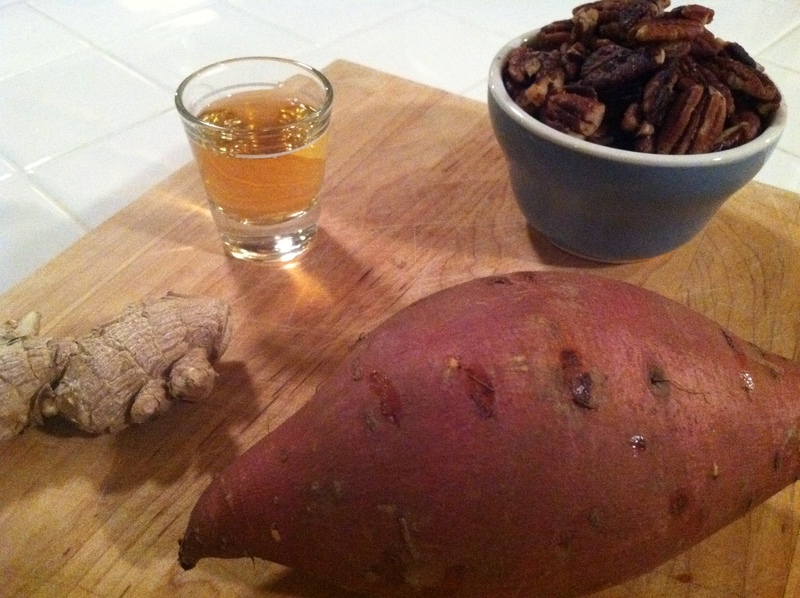 Put 2 1/2 cups sweet potato puree, eggs, dark-brown sugar, and bourbon into a food processor and process until combined. Stream cream in until evenly incorporated. 5. Pour into cooled crust, and bake in the oven until the custard has set in the middle for about an hour. Cool to room temperature. 6. To make the meringue, combine the sugar and 1/3 cup water in a small saucepan, making sure there are no sugar crystals clinging to the sides of the pan. Place over medium heat, and cook until bubbles thicken and slow. 7. While the sugar is cooking, whisk the egg whites and salt in the bowl of a mixer to medium peaks. 8. When the syrup reaches 240 degrees on a candy thermometer, remove from the heat and stream it slowly down the side of the mixer bowl into the whites while whisking on high speed. Continue whisking until very stiff and just slightly warm. Add the vanilla and mix to combine. 9. Spoon the meringue on top of the pie, making decorative swirls. 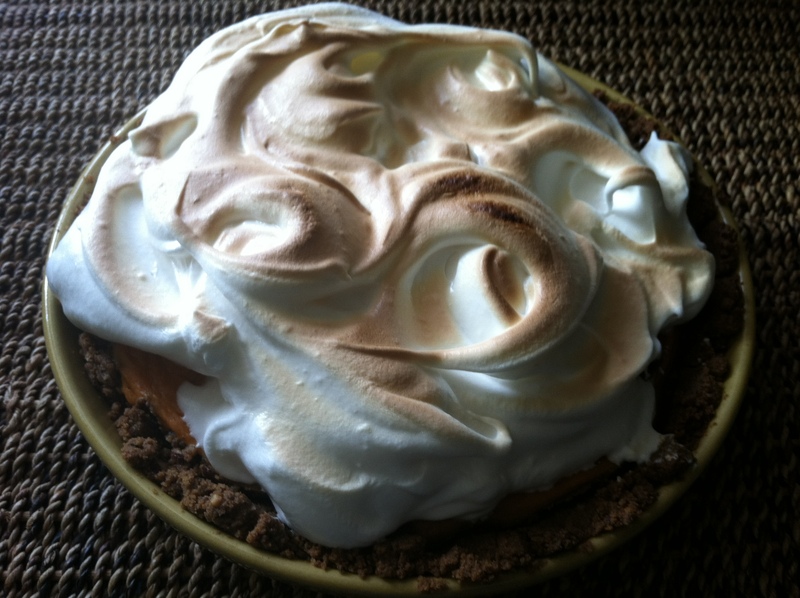 Lightly brown the top of the meringue with a kitchen torch or under the broiler, watching constantly for browning. Because seriously, who has a kitchen torch? Stay tuned! There’ll be more of these yummers coming up for T-day. 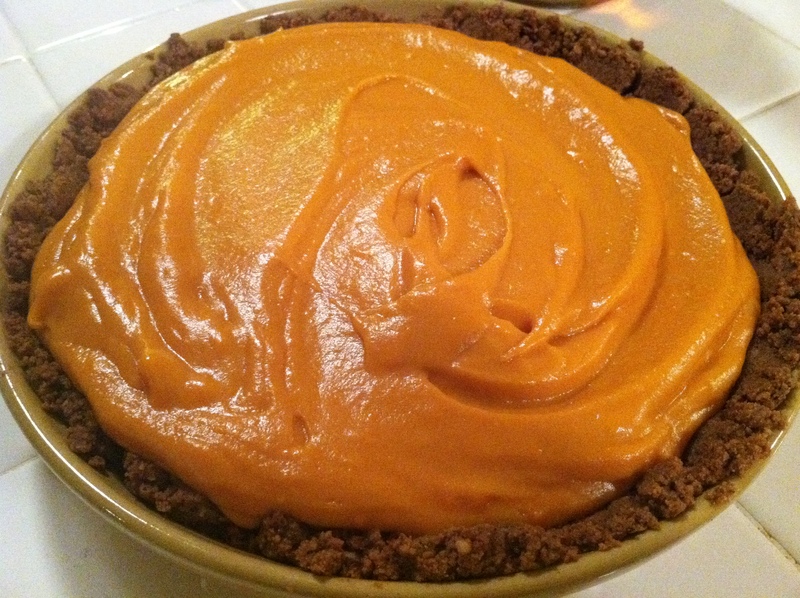 Tags: gluten free recipes, gluten-free holiday, gluten-free pie, gluten-free thanksgiving. Bookmark the permalink. Previous post ← Is This a Gluten-Free Girl Scout Cookie???? 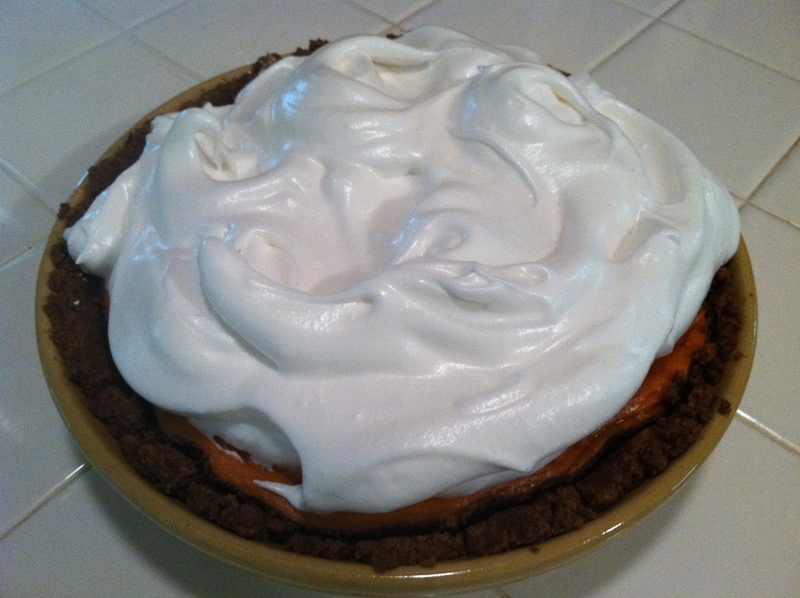 I was just joking with my brother this morning about making a gf pie with bourbon in it! Now, I have found that very pie I’m going to make! Thanks for sharing!! Your blog name and header have me laughing hysterically!!!!!! Great pie too! I’m working on a GF crust recipe as well. The filling looks awesome! Thanks Ashley! If you come up with a killer gf pie crust recipe, PLEASE let me know. After much trial & error, here is a gluten-free (along w/ other allergies) pie crust that I came up with. Your pie recipe looks delicious, so I thought I might try to incorporate the extra pie ingredients (pecans, ginger, etc.) into my pie crust instead of the graham crackers. Thanks for sharing! I think I found it retweeted by udi’s on twitter. I’ve never thought about grinding the flours. I’m guessing it makes it less gritty? Because that seems to be one of the big problems (I mean, among others) and I’m wondering if that does the trick. Thank you for sharing, I’m totally trying this! Your pie looks awesome, by the way. I made the pie with pumpkin instead of potato and it was fantastic!! I also only baked the crust for 10 minutes and then added the filling and continued to bake the pie and that also turned out great. What a treat to eat a pie and a delicious! crust. The last pie crust I made was a GF frozen crust that cost $6 and tasted exactly like cardboard. I won’t be buying that again. That’s awesome. I agree the crust is the best part of this recipe. I could just eat it in a bowl. Pingback: Missed connections. « Sheppard's Pie. I am making this recipe right now! Thanks for the inspiration. I’m using Cool Whip instead of meringue because I don’t have the patience, but I think it will still be great. Thanks for the recipe! Rad! Cool Whip should be on every Thanksgiving table.